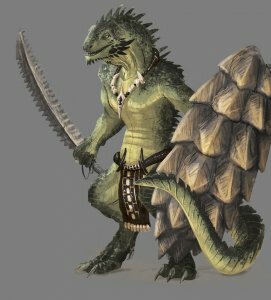 The fearsome, combative, plains-dwelling Kala people (think lizardfolk) pride themselves on their fierce warriors, who wade into battle and gang up on the most powerful enemy. It’s easy for melee combat in D&D and other fantasy RPGs to get predictable. Melee monsters spread out amongst the front-line PCs, while ranged monsters stick to the back and look for where they can do most damage. Kala Warriors are different. They will all coordinate to take down the biggest enemy, regardless of other powerful melee fighters in the battle. While this may cost them one or two warriors, their pack tactics can brutalize even a high-HP barbarian or paladin that the party counts on to hold the line, quickly shifting the tide of battle. Combine this with kala archers and warcasters for a tough battle. As such, if you’re dropping the kala warrior alone into your campaign, beware that it can do a lot of damage in groups. Use slightly fewer than you normally would until you’re sure of how the PCs will deal with them. Pack Tactics. 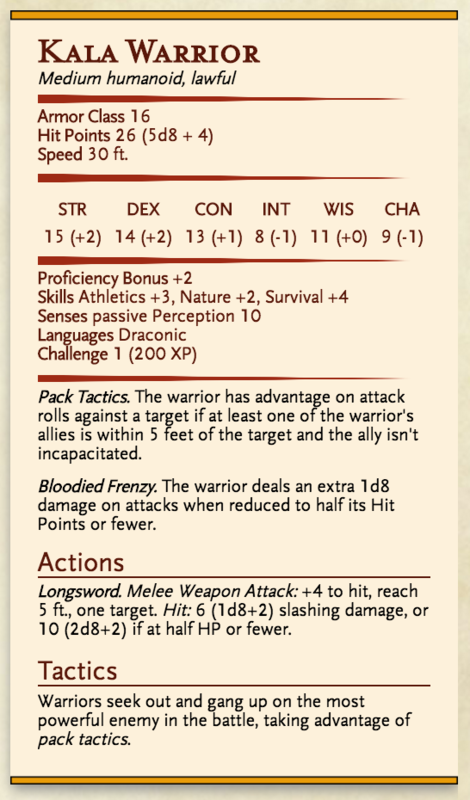 The warrior has advantage on attack rolls against a target if at least one of the warrior’s allies is within 5 feet of the target and the ally isn’t incapacitated. Bloodied Frenzy. The warrior deals an extra 1d8 damage on attacks when reduced to half its Hit Points or fewer. Longsword. Melee Weapon Attack: +4 to hit, reach 5 ft., one target. Hit: 6 (1d8+2) slashing damage, or 10 (2d8+2) if at half HP or fewer. Warriors seek out and gang up on the most powerful enemy in the battle, taking advantage of pack tactics.